The Wildlife Conservation Society commends the Russian government for creating a new national park to protect critically endangered Amur (Siberian) tigers and the world's rarest big cat: the Far Eastern leopard. 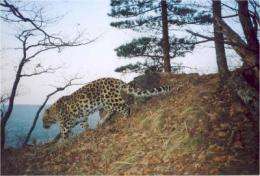 Called "Land of the Leopard" National Park, the new protected area in the Russian Far East was declared on April 9th. It safeguards 1,011 square miles (262,000 hectares) of leopard and tiger habitat. The park was created through the merger of three existing protected areas: Kedrovya Pad Reserve, Barsovy Federal Wildlife Refuge, and Borisovkoe Plateau Regional Wildlife Refuge. In addition, key previously unprotected lands have been added along the Chinese border and in the northeast portion of the leopard's range. "The new park is great news for Far Eastern leopards and Amur tigers," said WCS Russia Program Director Dale Miquelle. "We commend the Russian government for their foresight in creating this new protected area, and we are optimistic that it will provide a critical refuge for some of the most endangered big cats on the planet." The last 30 or so remaining Far Eastern leopards occur in a narrow sliver of Russian forests between the Sea of Japan to the east and Jilin Province, China, to the west. While tigers occur over a much broader region to the north, this Southwest region of Primorskii Krai also retains a vital yet small population that regularly move across the border into Hunchun Reserve China, and thus represent a critical source population for recovery of tigers in Northeast China. "This is tremendous news for big cat conservation," said Peter Zahler, WCS Deputy Director for Asia. "The creation of this park greatly increases the amount of land protecting critical populations of two of the world's big cats, and it will go a long way to securing their future. We look forward to continuing to provide whatever support is requested to help conserve tigers and leopards in the region."